The Fourth of July, aka America’s Independence Day, is right around the corner. You may have noticed it’s coming due to the preponderance of Red, White and Blue gear and foods that shout at you from store shelves. Or the fact that summer weather has officially arrived. Or perhaps the creative Fourth of July pins dotting your Pinterest feed. In any case, it’s a highlight of every summer. 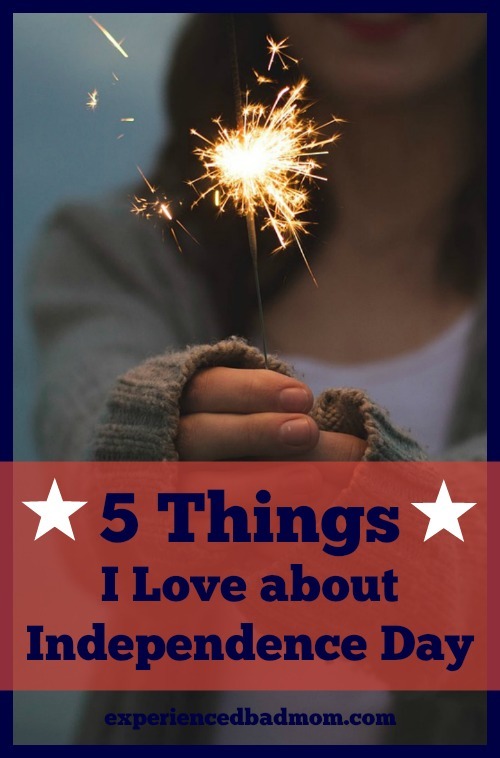 In honor of the Fourth of July, here are 5 things I love about America’s Independence Day. Stick around for #5 as it includes all the details about a patriotic giveaway! These are so fun and easy. Remember writing your name with a sparkler? I don’t even mind it when they burn all the way down and you get your fingers a little hot. Nothing says Happy Fourth of July like a yummy cake with Cool Whip and fruit in the shape of Old Glory. I don’t make these, because I’m lazy, but I love it when someone else does. Do you buy a Fourth of July t-shirt every year? I’m not that organized, but I do love to find the most unabashedly red, white, and blue items I own and throw them all on my body in a patriotic fervor. Whether I’m at a lake, a barbecue, or simply in my backyard, I love being outside in the summer. After surviving our long and tough winters here in the Midwest, it is an absolute joy to spend a full day outside soaking up some Vitamin D and feeling the wind on my exposed arms and legs. I get a bit verklempt about America around the Fourth of July. We really do have an amazing country. 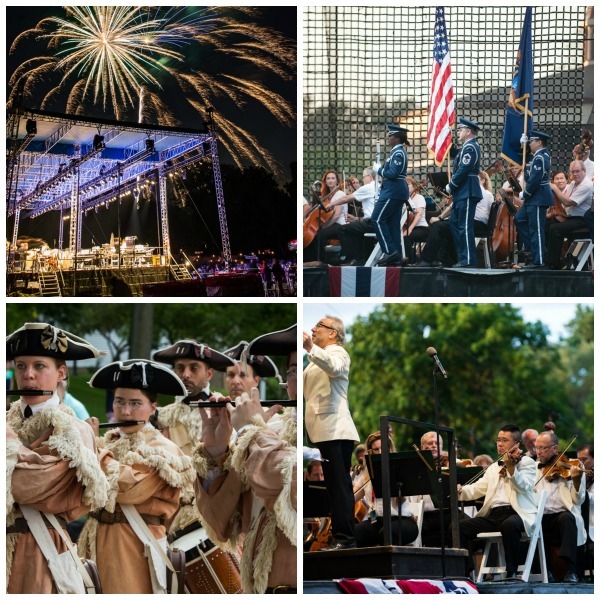 There’s no better way to celebrate our history and freedom than with fireworks and an outdoor concert. This year I’m excited to offer one lucky reader a family four pack of tickets to do just that at The Henry Ford’s Salute to America at Greenfield Village in Dearborn, Michigan. A Salute to America Collage. All photos courtesy of The Henry Ford. The winner can pick one evening to attend between June 30 and July 3, 2016. If you want to win, enter via the Rafflecopter below. If you can’t make it to Michigan this Fourth of July, tell me your favorite way to celebrate Independence Day. That sounds like an awesome giveaway! Unfortunately, Google tells em it’s an 11 hour drive! I reckon we’ll just stay home and do our regular day of street fairs and parades. This year will be a little different because my daughter with be with my parents. The calendar just worked out that way with camps and all. Rabia @TheLiebers recently posted…He’s Mine! He’s Nine! No 11 hour drive, huh? Street fairs and parades sound lovely. I saw some fireworks and a symphony show in Virginia one year – I think at Wolftrap?! Cross your fingers, Katy. Cross all your crossibles, please. There’s a very real possibility that for the very first time since I was 8, that I’ll be in the States for July 4th. Sadly not in your part of the world, but still. I’ll keep you posted. I do remember being on the roof of my sister’s godmother’s house in Boston on July 4th, back when I was 8. Watching the incredible fireworks. It was magical. I too LOVE the 4th! It’s just the perfect middle of the summer celebration and for all the right reasons! My kids love the fireworks and all the activities surrounding this holiday. I’m smiling just thinking about it all- and now I’m getting excited to partake of the fun and the food and definitely holding those sparklers!! I wish I lived in Michigan… I’d love those tickets! Yes! fingers crossed for you. Fireworks and the symphony would be a rather sophisticated, but special, celebration. Most folks just get the fireworks. We always hung out with my cousins at the lake for 4th of July growing up, and it was the best! Parades, picnics, a day at the beach and fireworks are my favorite memories of the 4th of July! Ah, sparklers! They were my absolute favorite as a kid. 🙂 We live in the DC area and on the occasions when we’ve worked up the nerve to brave the crowds, we have really enjoyed the fireworks. However, the best I have ever seen were in Niagra Falls on July 4th. Canada and the US took turns with “competing” fireworks over the water — AMAZING! Enjoy your summer and the 4th!